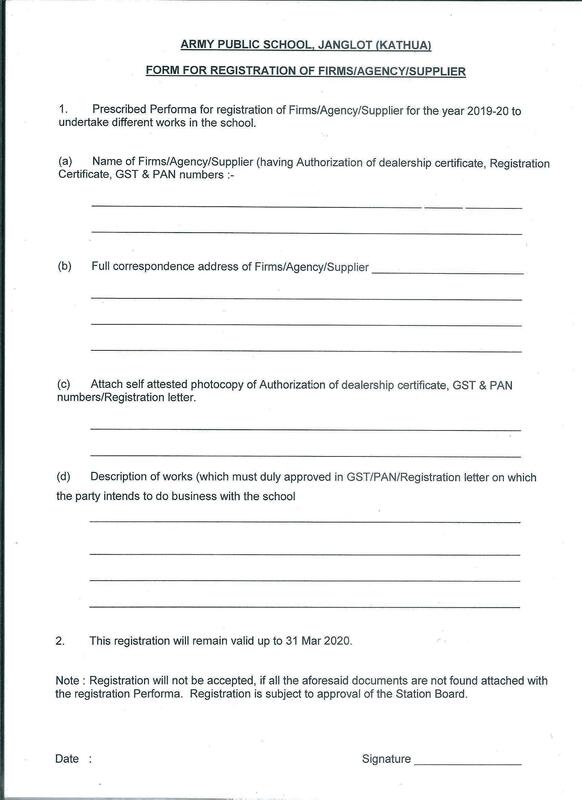 Applications are invited for registration of firms/agency/supplier for supply of various items required by the school during academic session 2019-20 (like Stationery, Printing Works, Computers & Peripherals, Medals/Trophies/Mementos, Sports items, Science Lab materials, Musical instruments, Library Books & CDs, Furniture (wooden/steel), Teaching Aids, Water Purifiers, ACs, Fans, Washing machines, Water coolers, CCTV cameras, PA Sound Systems, Hygiene & Sanitation items, Uniforms of Group ‘D’ employees, Refilling of Fire Extinguisher Cylinders, Iron welding works, Building repair/construction works, Carpenter for Wooden/PVC works, Catering service provider, Video recording/photos, Hiring of dresses, Hiring of tents, AMC of computers, ACs, Aqua guards water purifier, Intercom telephone exchange etc. Registration form may be downloaded from School website www.apsjanglot.org. Interested firms/vendors having valid GST/PAN/ Registration letter etc are eligible for registration. Registration is subject to approval of the Station Board. Last date for submission of registration documents is 01 Mar 2019. Students Registration forms can be procured at the time of admission. Thought for the day : Education is the most powerful weapon which you can use to change the world.